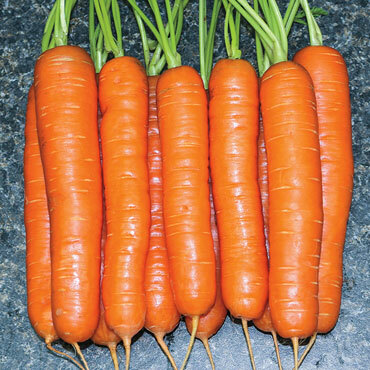 Perfect for salads, snacking or cooking, this Nantes-type carrot shines in any garden! Very sweet and packed with flavor, it produces 7-9" roots in a brilliant, deep orange color. Yaya holds very well in the ground, making it an excellent fall garden variety. It's easier than ever to plant with our handy 12" x 12" seed mats! Carrot seeds are encased in biodegradable paper that protects them during germination, and dissolves in the course of watering. Simply place seed mat in the garden or in one of our Grow Tub® containers and water. It helps create a unique square-foot garden with no worries about over- or under-seeding! 69 days to maturity. Seed Count: Approximately 200 seeds per packet. The seed tape has approx. 415 seeds per seed tape.